What seems like eons ago, I blogged about Clif Shot energy gels. Since then, it only takes me about a mile to take down a gel during a race. But now, the product has been reformulated (and I guess I have been reformulated over the years as well, :D). 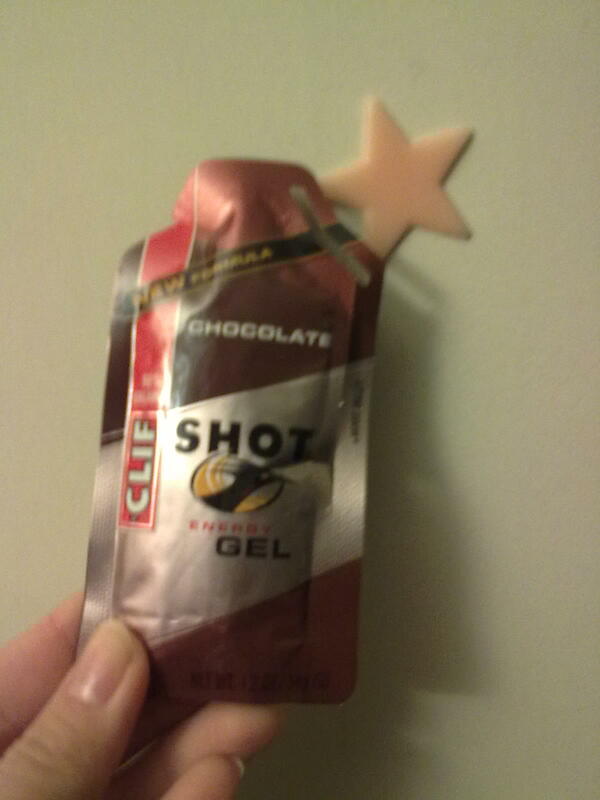 Clif sent me a sample of the new gel in the Chocolate flavor. I took it with me during a recent 15-miler and found it to be thick (perhaps due to cold) and rather tasty. Sure, it was very sweet. Maybe too sweet for some (but not me as I am dying from fatigue already halfway through the run), but the chocolatey flavor was very palatable and not artificial-tasting at all. I don't know if I'll ever get used to clif shots. I still use them, but cringe everytime I do. You take it over a mile? Wow, I just down it as quickly as possible (I use Gu). I hate taking it so much, I can't stand dragging it out. Do you think the Clif ones are better than Gu? How do you know when you need a salt packet or a gel/gu? I did a 10k this summer and still felt ok at the end but wiped. Fitness level or refuel station how will I know? I think salt and GUs are refueling routines that you sort of learn by trial-and-error. Wish there was a definitive formula, but people differ so widely. In general, I'd say that a GU is more of a pre-race fuel before a 10K if you can't handle food in your stomach but need fuel. I would also say that anything over 8 miles probably warrants a gel. A gel contains about 100 calories, which is what you burn in a mile, but the point of them is just to send the sugar in the blood for quick energy rather than replenishing your calories. Definitely practice when them in your training... I can't stress this enough. You may find it takes a while for you to get one down, or maybe you'll have it in a few gulps. They should be taken in with a little water, if possible. As for salt, it's probably not necessary for runs under 15 miles, unless it's REALLY hot and you're sweating a lot. Then maybe once an hour. I certainly don't want to recommend taking salt if it's not needed (because we all know it's not good for blood pressure and such).